Gear up for an entire weekend of guilt-free shopping, music and learning at Wilderfest on Dec 8th & 9th at Select City Walk, Saket, Delhi. 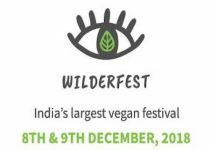 So if you’re an animal lover, environmentalist, health conscious or you just want to have a good time- Wilderfest is the place to be this coming weekend! This will be followed by a cooking demo and samples will be served.